Electronic Arts stopped into New York City with a boatload of upcoming games in tow for its seasonal battery of media preview sessions. The PlayStation Vita had a surprisingly limited presence when you consider that its release is imminent, but I did spy the fancy 2012-releasing handheld sitting alone amidst the maze of console stations devoted to EA Sports titles. The game: FIFA 12, the publisher’s critically acclaimed pro soccer simulator, ported to the Vita in a near features-complete package. I immediately dashed for the loose device, as this would be my first time going hands-on with the new Sony handheld. The thing that stood out to me almost immediately after picking up the gadget is how capable it is of spitting out near-console-quality visuals. Sure, you’ll get more eye candy out of playing the disc-based version of the game on a 50-inch LED TV, but the Vita delivers pretty enough pictures on its own, trumping what most portable devices that are currently on the market can deliver–especially non-gaming devices. I can’t say the same for the device’s form factor, however; not that it’s bad, but the device on display at the EA event was clearly an early production model. As far as the game itself goes, it’s FIFA top to bottom. There are a few Vita-specific elements that ought to enhance the experience for series veterans, but the core of the game should be immediately familiar to fans of the franchise. FIFA 12 is the rare sports simulation that delivers a good time even for those players that aren’t fans of the sport (case in point being yours truly). Just replicating that console game on a handheld would be enough on its own, but EA Canada brings some interesting wrinkles to the mix. The Vita offers a couple of features that you don’t get with a console, most notably the touch-sensitive front-mounted display screen and the rear-mounted touch-sensitive pad. 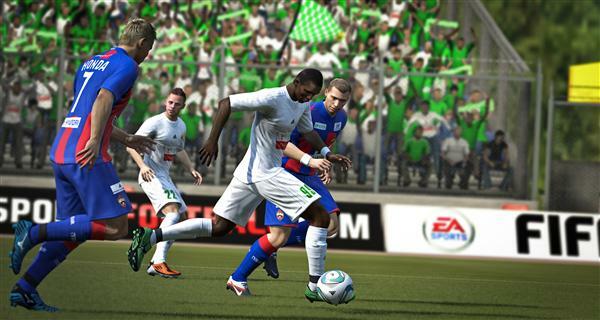 FIFA makes use of both of these enhancements with varying levels of success. Players can tap any teammate on the game’s display to immediately pass the ball to that person. The longer you hold your finger there, the more power gets put into the pass. It makes inventive use of the touchscreen and it’s cool in theory, but it definitely didn’t feel convenient or even particularly intuitive to take one hand off of the device to tap for a pass. The Vita’s rear-mounted touchpad, on the other hand, is put to fairly brilliant use in FIFA 12. One problem that fans of soccer and hockey simulations have faced for as long as those genres have existed has been putting shots on goal in specific places. 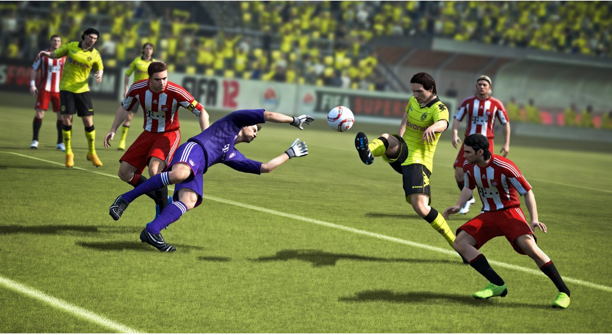 FIFA 12 addresses this directly in its Vita release by allowing players to aim for specific parts of the goal with pinpoint accuracy using the rear touchpad. It’s very simple: the shape of the goal and the shape of the touchpad are essentially the same; you tap the location you want to send the ball to and an onscreen indicator pops up to show you what part of the net you’re aiming for. The longer you hold your finger down, the harder the kick. It’s a game of balance though; hold your finger there for too long and you’ll kick too hard, sending the ball sailing past the goal and out of bounds. The touch-based controls can be disabled, of course, but they certainly seem to add quite a bit to the experience. The only potential problem is the need to take care with your fingers around that rear touchpad. It’s easy to accidentally shoot for the goal from midfield if you should accidentally grip the device in the wrong way. Holding the Vita to account for this difference isn’t necessarily awkward, but it takes some getting used to. Overall, however, FIFA 12 does exactly what it needs to on the Vita, and then some. It’s the same great game that fans love to play on their consoles, only now you’ll be able to play it on the go. The touch-based features promise to add a great deal to the experience too, but even if you turn them off and just play using the controls you know, the Vita seems to deliver in all of the same ways that the bigger screen version of the game does.